Inside Quest: Tony Robbins on the Science of Achievement features Tom Bilyeu, one of the founders of the successful power-bar company, Quest Nutrition, and one of his biggest inspirations, Tony Robbins, the philanthropist billionaire and master strategist. Tony may have had humble beginnings, but during the interview he discusses the traits and foundations that can be not only the key to success, but also the basis for personal fulfillment in all that you do. His book, Money: Master the Game, offers self-help and a path to financial independence for his avid readers. 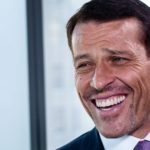 The interview between Tom Bilyeu and Tony Robbins is sure to strike a chord with viewers of all kinds.